1. A supportive community of scholars with an emphasis on cohort building and peer mentoring to enhance the success of all. 2. Development of academic skills (ex. critical thinking and data analysis), presentation skills, as well as grant and manuscript writing through regular data clubs, journal clubs, and workshops. 3. Optional summer lab exposure prior to beginning the first year graduate program in August. 4. Networking with IMSD alumni and other successful historically underrepresented role models in science. 5. Opportunities to cultivate leadership skills through outreach activities and Vanderbilt Owen School of Graduate Management leadership development workshops. Students in the IMSD program enter our large first year Interdisciplinary Graduate Program (IGP) in biomedical research which is composed of eleven participating departments and programs: Biochemistry, Biological Sciences, Cancer Biology, Cell & Developmental Biology, Chemical Physical Biology, Human Genetics, Microbe-Host Interactions, Molecular Pathology & Immunology, Molecular Physiology and Biophysics, Neuroscience, and Pharmacology. IMSD students also enter the Quantitative and Chemical Biology Program , a smaller first year program that includes any of the above departments and programs as well as Biomedical Engineering, Chemical and Biomolecular Engineering, Chemistry, Mathematics, and Physics & Astronomy. The Vanderbilt IMSD program currently serves approximately 80 students in all phases of their graduate training. The attrition rate from this program is extremely low (<5%). Our graduates go on to develop careers in academic research, obtaining positions as postdoctoral fellows at leading research universities around the country, as well as in biopharma and in other areas (public policy, college teaching, etc). 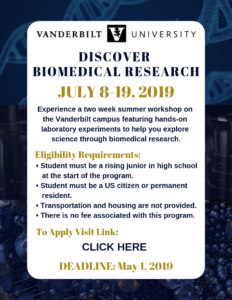 We encourage you to explore the pages of this website to find out more about the Vanderbilt IMSD program and how we can help you successfully achieve your career goals in biomedical research.